Send To Toys adds many useful “Send to” locations to your right-click menu & more. It works on Windows 7, Windows 8, Windows 8.1 and Windows 10 (all versions). It works on all 32-bit and 64-bit Windows computers. After reading that we decided to test Send To Toys for ourselves (and for you too) and we agree 100% with his opinion. This is one of the features that should have been built-in to Windows but never was. It integrates perfectly into Windows and you never even know it’s there. Our kind of program – small, quiet and useful. Well today, the last day of May 2018, Darcy wrote and wondered if this little gem workd in Windows 10… so I downloaded and installed it on my Windows 10 Version 1803 (the most resent version as of this date. And it works PERFECTLY! Send To Toys allows you to add folder and modify the Send To menu — so if you have a folder you normally save things to, that folder is the default Send To folder. This is one of those tiny and rare freeware gems that is rewarding for us to present to you. We think you’ll love it; we know you’ll find it very useful. – Send To “Clipboard (as content)” copies the content of the file to the clipboard. Supports the most common text and image file formats. – Send To “Folder…” sends a file or files to another folder, you will be shown a dialog box that lets you choose where the files should be copied, moved, or have a shortcut created. To move the files press and hold down the SHIFT key. To create a shortcut hold down the SHIFT and CTRL keys. 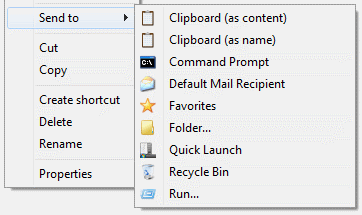 Above: Send To Toys – Send to clipboard dialog. Below: Send To Toys right-click dialog (when you right click a file or folder). We can also tell you it works all versions of Windows from XP through Windows 10 and runs on both 32bit and 64bit computers. We originally tested this program on August 12, 2015 and again today, May 31, 2018 and Send To Toys works great and the installer was free from any malware or an added software… it’s 100% good, clean freeware! We give it our EB Seal of Approval! You can read more about and or download Send To Toys from this link. What version do we download? if you want one of the international versions, click on the appropriate flag. If not, move your cursor to the far right and click — Download (1937K) — in bold type above the blue line.